“Thank you very much and good afternoon. I can think of no more fitting place to begin my visit at this hopeful moment in our common history than here at Hanoi National University. I was given a Vietnamese phrase; I am going to try to say it. If I mess it up, feel free to laugh at me. Xin chao cac ban. (Hello, everybody). So much of the promise of this youthful nation is embodied with you. I learned that you have exchanges here with students from nearly 100 universities, from Canada to France to Korea — and that you are now hosting more than a dozen full-time students from your partner school in the United States, the University of California. I salute your vigorous efforts to engage the world. Of course, like students everywhere, I know you have things to think about other than your studies. For example, in September, you had to study for your classes and watch the Olympic accomplishments of Tran Hieu Ngan in Sydney. And this week you have to study and cheer Le Huynh Duc and Nguyen Hong Son in Bangkok at the football matches. I am honored to be the first American President to see Hanoi, and to visit this university. But I do so conscious that the histories of our two nations are deeply intertwined in ways that are both a source of pain for generations that came before, and a source of promise for generations yet to come. Two centuries ago, during the early days of the United States, we reached across the seas for partners in trade and one of the first nations we encountered was Vietnam. In fact, one of our founding fathers, Thomas Jefferson, tried to obtain rice seed from Vietnam to grow on his farm in Virginia 200 years ago, By the time World War II arrived, the United States had become a significant consumer of export from Vietnam. In 1945, at the moment of your country’s birth, the words of Thomas Jefferson were chosen to be echoed in your own Declaration of Independence: “All men are created equal. The creator has given us certain inviolable rights, — the right to life, the right to be free, the right to achieve happiness.” Of course, all of this common history, 200 years of it, has been obscured in the last few decades by the conflict we call the Vietnam War and you call the American War. You may know that in Washington, D.C. on our National Mall, there is a stark black granite wall engraved with the name of every single American who died in Vietnam. At this solemn memorial, some American veterans also refer to the “other side of the wall,” the staggering sacrifice of the Vietnamese people on both sides of that conflict — more than three million brave soldiers and civilians. This shared suffering has given our countries a relationship unlike any other. Because of the conflict, America is now home to one million Americans of Vietnamese ancestry. Because of the conflict, three million American veterans served in Vietnam, as did many journalists, embassy personnel, aid workers and others who are forever connected to your country. Our new relationship gained strength as American veterans launched non profit organisations to work on behalf of the Vietnamese people, such as providing devices to people with war injuries to help them lead more normal lives. Vietnam’s willingness to help us return the remains of our fallen servicemen to their families has been the biggest boost to improve ties. And there are many Americans here who have worked in that endeavor for many years now, including our Secretary of Veterans Affairs, Hershel Gobar. The desire to be reunited with a lost family member is something we all understand. It touches the hearts of Americans to know that every Sunday in Vietnam one of your most-wanted television shows features families seeking viewers help in finding loved ones they lost in the war so long ago now. And we are grateful for the Vietnamese villagers who have helped us to find our missing and, therefore, to give their families the peace of mind that comes with knowing what actually happened to their loved ones. No two nations have ever before done the things we are doing together to find the missing from the Vietnam conflict. Teams of Americans and Vietnamese work together, sometimes in tight and dangerous places. The Vietnamese government has offered us access to files and government information to assist our search. And, in turn, we have been able to give Vietnam almost 400,000 pages of documents that could asist in your search. On this trip, I have brought with me another 350,000 pages of documents that I hope will help Vietnamese familes find out what happened to their missing loved ones. Today, I was honoured to present these to your President, Tran Duc Luong. And I told him before the year is over, America will provide another million pages of documents. We will continue to offer our help and to ask for your help as we both honor our commitment to do whatever we can for as long as it takes to achieve the fullest possible accounting of our loved ones. Your cooperation in that mission over these last eight years has made it possible for America to support international lending to Vietnam, to resume trade between our countries, to establish formal diplomatic relations and, this year, to sign a pivotal trade agreement. Finally, America is coming to see Vietnam as your people have asked for years — as a country, not a war. A country with the highest literacy rate in Southeast Asia; a country whose young people just won three Gold Medals at the International Math Olympiad in Seoul; a country of gifted hardworking entrepreneurs emerging from years of conflict and uncertainty to shape a bright future. Today, the United States and Vietnam open a new champter in our relationship, at a time when people all across the world trade more, travel more, know more about and talk more with each other than ever before. Even as people take pride in their national independence, we know we are becoming more and more interdependent. The movement of people, money and ideas across borders, frankly breeds suspicion among many good people in every country. They are worried about globalization because of its unsettling and unpredictable consequences. Yet globalization is not something we can hold off or turn off. It is the economic equivalent of a force of nature — like wind or water. We can harness wind to fill a sail. We can use water to generate energy. We can work hard to protect people and property from storms and floods. But there is no point in denying the existence of wind or water, or trying to make them go away. The same is true for globalization. We can work to maximize its benefits and minimize its risks, but we cannot ignore it — and it is not going away. In the last decade, as the volume of world trade has doubled, investment flows from wealthy nations to developing ones have increased by six times, from 25 billion dollars in 1990 to more than 150 billion dollars in 1998. Nations that have opened their econoimis to the international trading system have grown at least twice as fast as nations with closed econonmies. Your next job may well depend on foreign trade and investment. Come to think of it, since I have to leave office in about eight weeks, my next job may depend on foreign trade and investment. Over the last 15 years, Vietnam launched its policy of Doi Moi, joined APEC and ASEAN, normalized relations with the European Union and the United States, and disbanded collective farming, freeing farmers to grow what they want and earn the fruits of their own labor. The results were impressive proof of the power of your markets and the abilities of your people. You not only conquered malnutrition, you became the world’s second largest exprorter of rice and achieved stronger overall economic growth. Of course, in recent years the rate of growth has slowed and foreign investment has declined here, showing that any attempt to remain isolated from the risks of a global economy also guarantees isolation from its rewards, as well. General Secretary Le Kha Phieu said this summer, and I quote, “We have yet to achive the level of development commensurate with the possibilities of our country. And there is only one way to further open up the economy.” So this summer, in what I believe will be seen as a pivotal step toward your future prosperity, Vietnam joined the United States in signing an historic bilateral trade agreement, building a foundation for Vietnam’s entry eventually into the World Trade Orgaization. Under the agreement, Vietnam will grant to its citizens, and over time to citizens of other countries, rights to import, export and distribute goods, giving the Vietnmese people expanding rights to determine their own economic destiny. Vietnam has agreed it will subject important decisions to the rule of law and the international trading system, increase the flow of information to its people, and accelerate the rise of a free economy and the private sector. Of course, this will be good for Vietnam’s foreign partners, like the United States. But it will be even better for Vietnam’s own entrepreneurs, who are working hard to build businesses of their own. Under this agreement, Vietnam could be earning, according to the World Bank, another 1.5 billion dollars each and every year from exports alone. Both our nations were born with a Declaration of Independence. This trade agreement is a form of declaration of interdependence, a clear, unequivocal statement that prosperity in the 21st century depends upon a nation’s economic engagement in the rest of the world. This new openness is a great opportunity for you. But it does not guarantee success. What else should be done? Vietnam is such a young country, with 60 percent of your population under the age of 30, and 1.4 million new people entering your work force every year. Your leaders realize that government and state-owned businesses cannot generate 1.4 million new jobs every year. Thy know that the industries driving the global economy today — computers, telecommunications, biotechnology — these are all based on knowledge. That is why economies all over the world grow faster when young people stay in school longer, when women have the same educational opportunities that men have, when young people like you have every opportunity to explore new ideas and then to turn those ideas into your own business opportunities. You can be — indeed, those of you in this hall today must be — the engine of Vietnam’s future prosperity. As President Tran Duc Luong has said, the internal strength of the country is the intellect and capacity of its people. The United States has great respect for your intellect and capacity. One of our government’s largest educational exchange programs is with Vietnam. And we want to do more. Senator Kerry is right there, and I mentioned him earlier — is leading an effort in our United States Congress, along with Senator John McCain and other veterans of the conflict here, to establish a new Vietnam Education Foundation. Once enacted, the foundation would support 100 fellowships every year, either here or in the United States, for people to study or teach science, math, technology and medicine. We’re ready to put more funding in our exchange programs now so this effort can get underway immediately. I hope some of you in this room will have a chance to take part. And I want to thank Senator Kerry for this great idea. Thank you, sir, for what you have done. Let me say, as important as knowledge is, the benefits of knowledge are necessarily limited by undue restrictions on its use. We Americans believe the freedom to explore, to travel. to think, to speak, to shape decisions that affect our lives enrich the lives of individuals and nations in ways that go far beyond economics. Now, America’s record is not perfect in this area. After all, it took us almost a century to banish slavery. It took us even longer to give women the right to vote. And we are still seeking to live up to the more perfect union of our founders’ dreams and the words of our Declaration of Independence and Constitution. But along the way over these 226 years — 224 years — we’ve learned some lessons. For example, we have seen that economics work better where newspapers are free to expose corruption, and independent courts can ensure that contracts are honored, that competition is robust and fair, that public officials honor the rule of law. In our experience, guaranteeing the right to religious worship and the right to political dissent does not threaten the stability of a society. Instead it builds people’s confidence in the fairness of our institutions, and it enables us to take it when a decision goes in a way we don’t agree with. All this makes our country stronger in good times and bad. In our experience, young people are much more likely to have confidence in their future if they have a say in shaping it, in choosing their governmental leaders and having a government that is accountable to those it serves. Now, let me say emphatically, we do not seek to impose these ideals, nor could we. Vietnam is an ancient and enduring country. You have proved to the world that you will make your own decisions. Only you can decide, for example, if you will continue to share Vietnam’s talents and ideas with the world; if you will continue to open Vietnam so that you can enrich it with the insight of others. Only you can decide if you will continue to open your markets, open your society and strengthen the rule of law. Only you can decide how to weave individual liberties and human rights into the rich and strong fabric of Vietnamese national identity. Your future should be in your hands, the hands of the Vietnam people. But your future is important to the rest of us as well. For as Vietnam succeeds, it will benefit this region and your trading partners and your friends throughout the world. We are eager to increase our cooperation with you across the board. We want to continue our work to clear land mines and unexploded ordnance. We want to strengthen our common efforts to protect the environment by phasing out leaded gasoline in Vietnam, maintaining a clean water supply, saving coral reefs and tropical forests. We want to bolster our efforts on disaster relief and prevention, including our efforts to help those suffering from the floods in the Mekong delta. Yesterday we presented to your goverment satellite imagery from our Global Disater Information Network — images that show in great detail the latest flood levels on the delta that can help Vietnam to rebuild. We want to acclerate our cooperation in science, cooperation focused this month on our meeting in Singapore to study together the health and ecological effects of dioxin on the people of Vietnam and the Americans who were in Vietnam; and cooperation that we are advancing further with the Science and Technology Agreement our two countries signed just today. We want to be your ally in the fight against killer diseases like AIDS, tuberculosis and malaria. I am glad to announce that we will nearly double our support of Vietnam’s efforts to contain the AIDS crisis through education, prevention, care and treatment. We want to work with you to make Vietnam a safer place by giving you help to reduce preventable injuries — on the streets, at home and in the workplace. We want to work with you to make the most of this trade agreement, by providing technical assistance to assure its full and smooth implementation, in finding ways to encourage greater United States investment in your country. We are, in short, eager to build our partnership with Vietnam. We believe it’s good for both our nations. We believe the Vietnamese people have the talent to succeed in this new global age as they have in the past. We know it because we’ve seen the progress you have made in this last decade. We have seen the talent and ingenuity of the Vietnamese who have come to settle in America. Vietnamese-Americans have become elected officials, judges, leaders in science and in our high-tech industry. Last year, a Vietnamese-American achieved a mathematical breakthrough that will make it easier to conduct high-quality video-conferencing. And all America toook notice when Hoang Nhu Tran graduated number one in his class at the United States Air Force Academy. Let the days when we talk past each other be gone for good. Let us acknowledge our importance to one another. Let us continue to help each other heal the wounds of war, not by forgetting the bravery shown and the tragedy suffered by all sides, but by embracing the spirit of reconciliation and the courage to build better tomorrows for our children. May our children learn from us that good people, through respectful dialogue, can discover and rediscover their common humanity, and that a painful, painful past can be redeemed in a peaceful and prosperous future. Agence France Presse – November 17, 2000. This entry was posted on Wednesday, April 18th, 2012 at 3:19 am and is filed under Quốc tế. You can follow any responses to this entry through the RSS 2.0 feed. Both comments and pings are currently closed. Former President Bill Clinton gave a fiery and eloquent speech at the Democratic National Convention this evening. President Clinton is a statesman and a leader on both the national stage in the U.S. and internationally. 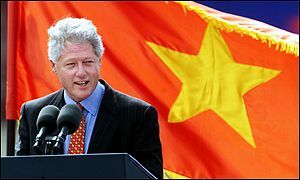 My mother highly respected President Clinton and thought he was a great President, and she often said that “Ong Tong Thong Clinton co long tot va la mot nguoi dao duc” (“President Clinton has a good heart and is a person of compassion”). President Clinton is a man of Peace. Bác Hiệu Minh ơi, cháu tìm video của bài nói này mà không có. Bác có link xem video bài nói này của Tổng thống Bill Clinton không ạ ? Tổng Cua phải dịch ra tiếng Việt cho chúng tôi những người không biết tiếng Anh cùng đọc chứ ạ ? Bản dịch ở trong Entry “Public Speaking…” đó bác à….